Damien Landers of Ireland after competing in the senior men's event during the European Cross Country Championship at Beekse Bergen Safari Park in Tilburg, Netherlands. Photo by Sam Barnes/Sportsfile. On a muddy and demanding course, the team saw Ryan Forsyth run well, finishing just off a medal with a superb fourth place and the team was sixth overall. The U20 junior women’s team also placed sixth overall, but only four points off a medal. The U20 men's team placed fifth overall with Darragh McElhenny first scorer in 16th. 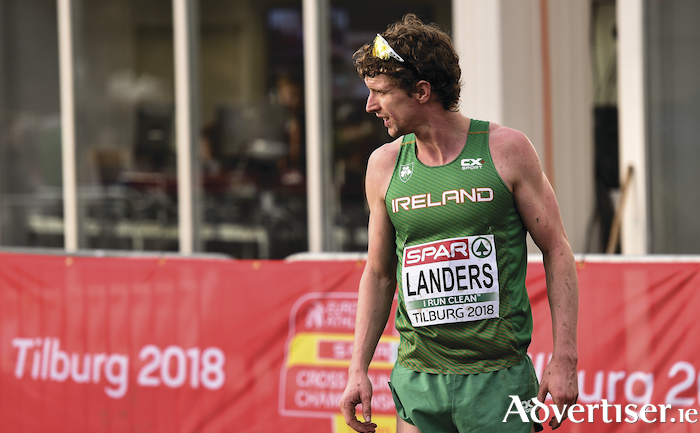 NUI Galway athlete Damien Landers, who runs with Ennis Track, was called into the Irish senior men's squad and made a strong debut, placing 78th overall in a world class field. The second major national cross-country championships will take place next weekend. The national novice cross country and juvenile uneven ages cross country for U11s, up to U19s will be held in Navan Adventure Park, adjacent to racecourse on Saturday December 15. Galway will be well represented at juvenile level, with Tuam AC, Craughwell AC and GCH among the clubs that will have athletes competing for honours. At adult level Galway have two strong novice teams, with the ladies led by Aisling Joyce of GCH and Caron Ryan of Craughwell, over a 4km distance. The Galway men’s team features such talented athletes as Jamie Fallon, Damien O Boyle, and Kevin Mooney of Craughwell AC, and Neill Keane and Naoise O Gibney of GCH and they will target a team medal, racing over 6km in what is traditionally a huge field of top-class runners. The famous Fields of Athenry 10k road race takes place on St Stephen’s Day in Athenry at 11am. The Resolution Run 5k Galway is the first race of 2019 on New Year’s Day in Galway City at 11am. Entry is now open for both events.